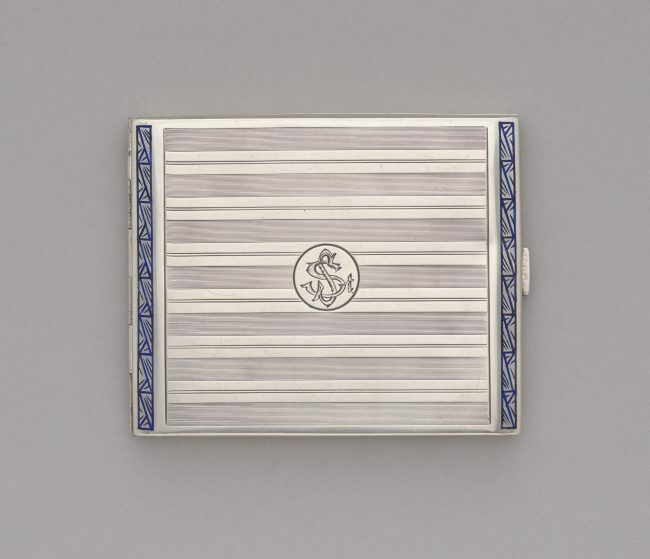 The cigarette case was manufactured in the interwar period, prior to 1931, by the Gold and Silverware Factory of Władysław Krupski and Jan Matulewicz, located in the Powiśle quarter – the riverside section of the city centre – at 12 Leszczyńska Street. Warsaw, for Mayor Stefan Starzyński (1893–1939), Warsaw’s most renowned mayor, a role-model of the function until today. Starzyński is esteemed for the development of Warsaw prior to World War II and his heroic defence of the city during the invasion of Nazi Germany in 1939. Bearing witness to the fact that the gift was meant for him is the engraving of the owner’s monogram “S St” on the lid and the dedication engraved inside: “To the beloved Mayor/Konarski.” Number 204 was punched on the button of the spring latch lock. Inside, both parts of the case include black rubber ribbons for holding cigarettes. Towards the end of August 1939, Mayor Starzyński paid a visit to Bronisława Glińska, the aunt of Wacław Paszkowski (1881–1950), professor at the Warsaw University of Technology, expert in reinforced concrete technology, designer and construction site manager of many buildings in Warsaw, such as the edifice of the State School of Hygiene on Chocimska Street. While leaving after the meeting with Ms. Glińska, Mayor Starzyński forgot to take the cigarette case from her apartment. Due to the outbreak of the war on 1 September 1939 and the turmoil which ensued, the precious keepsake remained with the aunt of Paszkowski, who collaborated with Starzyński at the Civic Committee headed by Juliusz Rómmel (1881–1967). Towards the end of December 1939, Mayor Starzyński was murdered by Germans. The keepsake was purchased by the Museum in 2009.